Many worried (myself included) how our princesses would adapt to life in Africa. We are pleased with their flexibility! 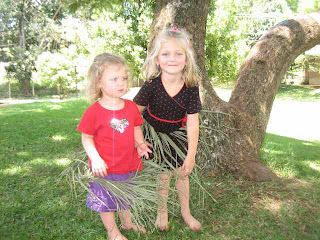 As you can see Amelia designed flowing green grass skirts for herself and her sister. Meredith and Amelia (better known as Sister) keep busy playing, cleaning, and designing the various rooms of their fort with mud-pies, sticks, and whatever they can find. Meredith rarely stops talking. She says phrases like allowed, dinner ready, and her favorite I do it, I do it. Meredith would proudly show you how she goes all the way under the water in the tub. She likes to sing a Swahilli Praise song, "Mambo Sawa Sawa" which translates into In God things are getting better. Amelia is learning addition at school, African Geography, and her site words (and, the, is, etc.) She is proud to know how to count by twos, fives, tens, and threes. Such precious stories. Such precious memories for you and your girls. This brings joy into my day as I sense their smiles and hear their laughter. I have been following your blog and I am so amazed by your family. You are an inspiration!! It is neat to see that your girls have adjusted so easily. Sometimes we can learn a thing or two from them. Please continue to keep your blog going. People are reading it and learning from you and your family. I sometimes live in my own little world and forget about the rest of the world. Thanks for your dedication to the less fortunate. p.s. -My little Gracie just turned 3. You helped deliver her along with Jen Savitski. I can't even tell you how much I love seeing our precious granddaughters! I am so excited and ready to just cuddle, kiss, and laugh with them. Keep posting those pictures--we need them!